Which AMSOIL Tier Is For Me? Which AMSOIL tier is best for my vehicle? Before the OE line of products it was hard for a new customer to try AMSOIL products because they were so heavily focused on extended drain intervals which had a large upfront cost for the high quality product. There wasn’t a short drain product available and the only way to get full value from the older AMSOIL products was to extend your drain interval. AMSOIL has realized their customers may have a new vehicle that they want to use quality AMSOIL products in but are not interested in extending drain intervals. It could be because the customer is trying to maintain the manufacturers warranty on a new vehicle or is still holding onto the 5000-km oil change mentality and isn’t sure any oil can extend drain intervals. Once the new car warranty expires there is a good chance this AMSOIL customer will “step up” into one of the extended drain products after realizing the quality of the introductory tier of AMSOIL products. Some customers may be interested in extending drains once their new car warranty has expired but don’t feel comfortable using a full year or 24,000-km interval. For these customers the XL line allows you to change the oil when you rotate on/off winter tires in the spring and fall if you drive less than 30,000-km per year. This saves the customer money, time and environmental waste oil/filters for those that currently change on a 5,000-km/3-month interval. The easiest customers to make suggestions for are the ones that want the best performance and protection no matter the cost. AMSOIL Signature Series is the best quality product and has the highest drain interval available from AMSOIL. If you are looking for your engine to outlive the body and other mechanical systems of your vehicle this is the oil for you. It is also the choice for customers looking to extend their oil changes to save money, protect the environment by producing less waste oil and used oil filters — use an EAO filter for best results — and to save time by eliminating up to 5 oil change appointments in a year up to 24,000-km. If you need help deciding what tier of AMSOIL products are best for your equipment or to get more information please contact me or read the post on how to purchase AMSOIL products. 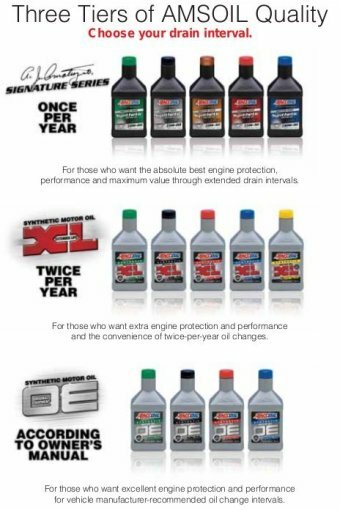 To look at the complete tiers of AMSOIL I put the technical properties of the 5W-20 oils suggested for my 2009 Mitsubishi Outlander XLS in a table from the AMSOIL website as of 2012-01-15. This information is available on the product detail page for EVERY AMSOIL product. You’re not likely to find this kind of information available from competitors concerned about hiding the quality of their products. TBN: The higher the TBN the more combustion acids can be neutralized for a longer period of time. This is an important number if you are planning on extending your oil change intervals. VI: Viscosity Index number – higher numbers are better as there will be less change to the viscosity as the oil is heated or cooled. Pour Point: The lower the pour point the more likely you will be able to start your vehicle in extreme cold conditions. CCS Viscosity: Cold Cranking Simulation Viscosity – a lower number is easier for the engine to turn over in cold start situations. NOACK Volatility: The lower the percentage the better – desribes how much an oil evaporates in high temperatures during use. Contaminates in a non-uniform oil may evaporate first leaving behind sludge.